3D Magic Maker Review: Does it Work? 3D Magic is a gel pen and LED light device that creates 3D objects. 3D Magic is a 3D pen that kids can use to create 3D creations and objects with the use of a LED device. The product website is get3dmagic.com, which was registered in July 2015. The screen capture below shows the official website in November 2015. 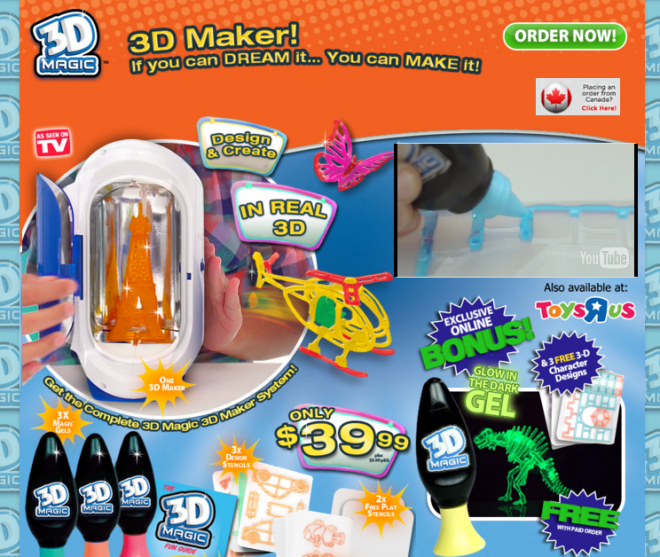 3D Magic 3D Maker is touted as a 3D pen which allows kids to create their own “3D” toys. The product works by means of a pen that contains a special gel. Kids then “draw” with this pen onto a sheet or template and allow their creation to dry. To create a 3D cube, for example, kids would draw out each wall on a flat surface. These walls would then be allowed to dry, and then the walls are connected together to form a three-dimensional object. As far as the product matching what is advertised, it does perform generally as advertised. It would be tough for kids to create an object as elaborate as the Eiffel Tower that is depicted on the product’s website, however. It’s a fun project, but the life of the pens is somewhat limited. The product’s biggest “con” is that of price, which at around $40 does not seem to be worth the sum of the final products. You can find refills which allow you to extend the product a bit longer. You may want to compare the product with I Do 3D Pens, which is quite similar and start a bit lower in price. Let us know what you think of 3D Magic by leaving a comment below and a star rating above. FoodSaver Reviews: Does it Work? FarmersOnly Review: Can You Find True Love?